She-Ra has a home! 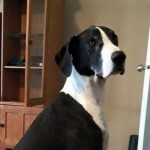 - Rocky Mountain Great Dane Rescue, Inc.
She-Ra has a home with Sheila & Dennis & Ronny in Murray, UT. This family has loads of experience with Great Danes! Right now they don’t have any as they have since passed….However, when the opportunity arose to foster Miss She-Ra they were “doors wide open” for this sweet girl. Once this lovely lady walked into their home, she wasn’t going anywhere else. They have affectionately renamed her She-Rocks.